To obtain copies of Kinross’ publications, please visit our corporate website at Kinross.com, or contact us by email at info@kinross.com or call 1-866-561-3636. Kinross publishes its corporate responsibility performance data annually and a comprehensive Global Reporting Initiative Report every two years. 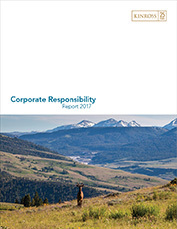 In 2018, we will publish our 2017 Corporate Responsibility Report online at 2017corporateresponsibilityreport.kinross.com.